Vision 2020, headquartered in Philadelphia at Drexel University’s Institute for Women’s Health and Leadership, is a national coalition advocating for women’s economic, political and social equality in the United States. In 2011, the National Panhellenic Conference became a Vision 2020 National Ally. Since then, we have been supporting the work of the Vision 2020 staff to make equality a national priority through shared leadership among women and men with an initial focus on business and government, where decisions are made, policies set and resources allocated. • Shared Leadership: Increase the number of women in senior leadership positions to achieve 50/50 representation of women and men by 2020 in targeted areas. • Economic Security: Achieve pay equity and advance women’s economic security throughout their lives. • Education: Educate young people to value women’s achievements, gender equality, shared leadership and civic engagement. • Civic Engagement: Engage and educate women voters and increase women’s participation in the political process. As part of the campaign efforts, Vision 2020 has joined forces with the organizing team at Let It Ripple, a California-based film studio that produces mini-documentaries often focused on social justice issues. In May 2017, Vision 2020 held a 50/50 Day event in Philadelphia that focused on gender equality and included a screening of a short film from Let It Ripple. Through the organizers’ grassroots efforts, more than 10,000 individual events also were held across the U.S. and in 60 countries. Events were held from Times Square to Kenya – all viewing the same film at the same time. The first event also included coverage on the Times Square billboard, ABC News, NPR, Variety, Bloomberg and Time Magazine. What a powerful statement that makes! 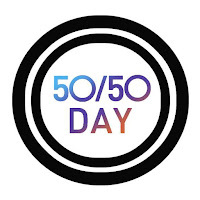 Early success of the film's screening inspired organizers at Vision 2020 to plan a second 50/50 Day event for April 26, 2018. As a National Ally, NPC is encouraging College and Alumnae Panhellenics to watch the 20-minute film followed by a facilitated reflection and discussion using the questions found here. Sorority women can also join the conversation through the 50/50 Day social media campaign. 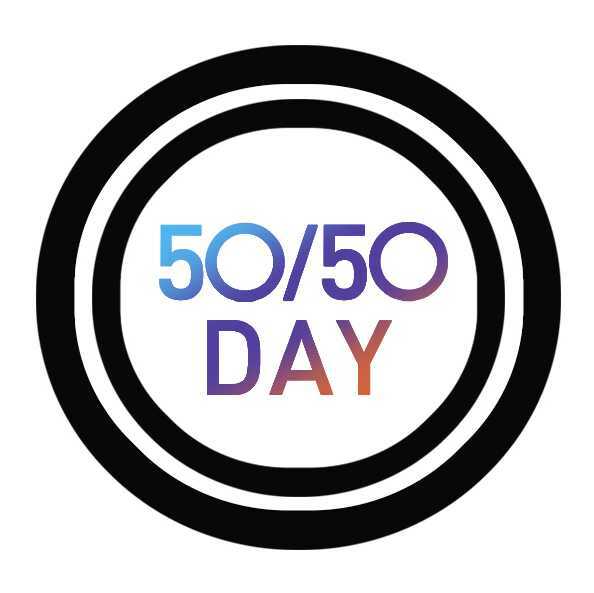 I encourage you to write down your answer to this question, “In six words, what does a gender-balanced world look like to you?” With these six words in hand, take a selfie with your written answer and post it to Facebook, Twitter and Instagram with the hashtag #Gettingto5050. If you also tag @npcwomen, we’ll be able to share your posts too. Join me and thousands of other men and women as we rethink the past, present and future of women in leadership. The short film can be viewed here. If your College or Alumnae Panhellenic would like to sign up to host a 50/50 Day event in 2018, you can do so here.